Are they looking for Kevin, the Cube? Fortnite: Battle Royale players are about to charge Epic Games for their labor. Players have spent the past few weeks digging dirt out of excavation sites in Paradise Palms, Dusty Divot, and near Loot Lake. 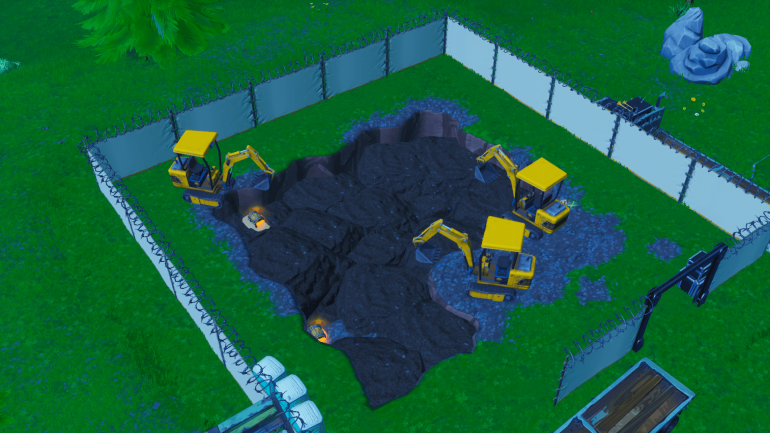 Now Epic seems to be setting up a huge excavation site to dig out the entire center island of Look Lake—and players will probably have something to do with it again. We have yet to learn if players will get a share of what they find buried in that area, and this new excavation site will probably be hiding something valuable. That’s the area where the giant purple cube that players called Kevin exploded in season six and created Leaky Lake. Before it exploded, it was making that center area of the island float in the air while causing a whirlpool in the lake below it. After it exploded, the Leaky Lake area became exactly like it is today. Some character or government body in Fortnite is eager to find the remains of Kevin, the Cube, it seems. The way the bulldozers are lined up makes it clear that the next digging work will be around that whole area. Since the eighth week of season eight is approaching, this must be somehow tied to the ending scenes of the season. The digging sites and the helicopter, which are the two biggest mysteries of the season, are converging toward Loot Lake while Epic develops the season eight lore indirectly through small map changes. It’s still unclear exactly what will happen at the end of season eight. Players might be able to help dig out the entire center area of Look Lake, or something else could happen. Regardless, something or someone in Fortnite hopes to find Kevin or parts of it again, and players might understand how and why in the next few weeks.